In the closing weeks of the presidential race, Hillary Clinton's campaign — and the outside groups that supported it — aired more television advertisements in Omaha than in the states of Michigan and Wisconsin combined. The Omaha ads were in pursuit of a single electoral vote in a Nebraska congressional district, which Clinton did not ultimately win, and also bled into households in Iowa, which also she did not win. 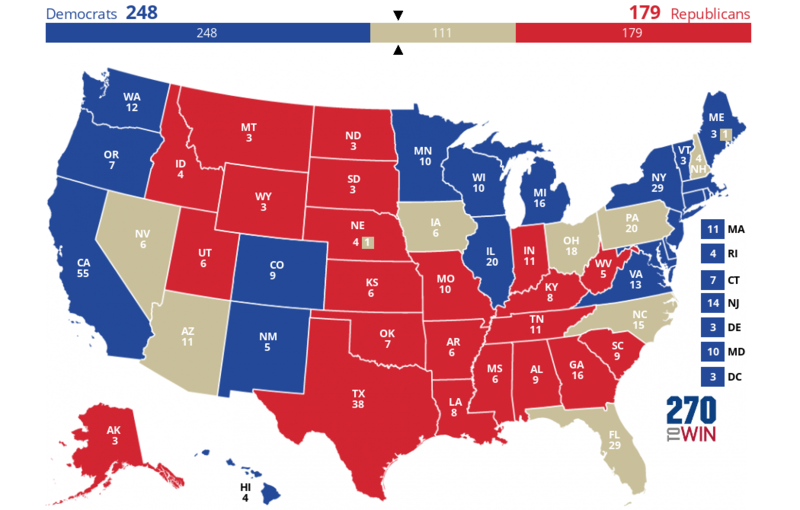 Michigan and Wisconsin add up to 26 electoral votes; she appears not to have won them, either. Strategic decisions can make all the difference in a close race. Clinton lost the White House (despite winning the popular vote) to Republican Donald Trump on the strength of about 100,000 votes in Michigan, Wisconsin and Pennsylvania. That is the definition of a close race. But a review of Democrats' advertising decisions at the end of the race suggests Clinton and her allies weren't playing to win a close one. They were playing for a blowout. And it cost them. Clinton and the groups backing her aired three times as many ads as Trump and his supporters over the course of the general election, according to data from the Wesleyan Media Project. Despite that advantage, the Democrats left several key states essentially unprotected on the airwaves as the race came to a close. From Oct. 14 through 30, they ran almost no ads in Wisconsin, Michigan and Virginia, and they aired less than half as many ads as Trump and his backers did in Colorado. By virtue of their spending choices, the pro-Clinton groups were essentially acting as if she had locked up as many as 248 electoral votes already. That is, of course, more than she would end up claiming. Here is the map as Democrats appear to have seen it, with the gray states the ones where they poured their late-October ad dollars. The upside to that Democratic strategy was that it gave Clinton a lot of different avenues to get the additional 16 electoral votes she would have needed to win the race. But there were several downsides to it. For one, most of those avenues were long shots. Using public polling data, FiveThirtyEight.com calculated each state's likelihood of being the “tipping point” of the election — which is to say, the one that pushed the winner over 270 electoral votes. By its odds, both candidates were wise to invest in North Carolina (11.2 percent chance), Pennsylvania (12.3 percent) and Florida (17.6 percent). Arizona, on the other hand, had less than a 2 percent chance to tip the race. Georgia was about 2 percent. Iowa was a little over 1 percent. And Michigan, which Democrats basically ignored until the very last days of the race? Nearly a 12 percent chance. To be fair, massive ad spending still left Clinton short in Ohio, North Carolina, Florida and even Pennsylvania. 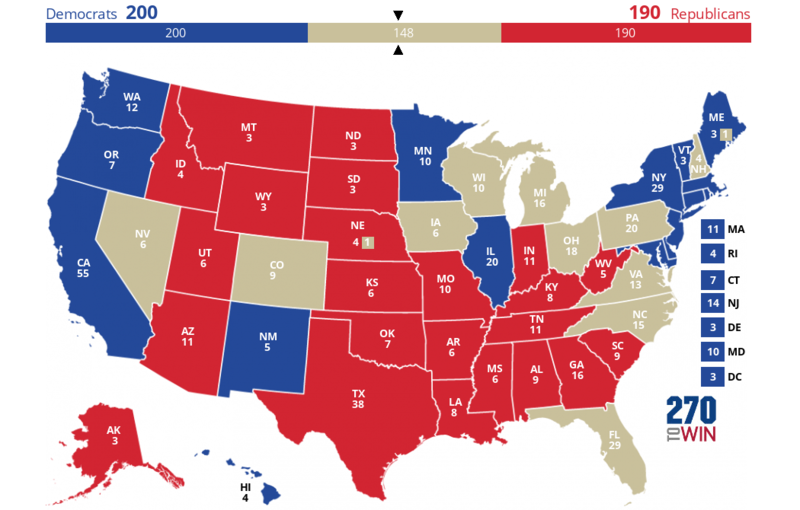 But it appears that in divvying their ad budgets, Clinton and her allies forgot a simple rule of presidential elections: You don't need more than 270 electoral votes to win. By playing so aggressively for a blowout, Democrats allowed the Trump team to poach two of their must-win states. A swing of 50,000 voters from Trump to Clinton across Wisconsin, Michigan (which has still not been called, officially) and Pennsylvania would have tipped the race to Clinton. There's no guarantee that shifting pro-Clinton ads from Phoenix and Des Moines to Detroit, Milwaukee and Erie would have done the trick. But it might have.